For years I've been reading the Bible with Aiden and Zachary at night and we've always used the New International Version, which is also what I use when I'm reading for myself. A couple of weeks ago I thought it would be interesting (for them and for me) to read the New Testament in The Message. We're currently reading Matthew. If you've never tried reading The Message, I highly recommend it. Eugene Peterson's paraphrase of the Bible is written in contemporary English, meaning it sounds a lot more like how we normally talk than other translations do. Every now and then, as I'm reading, Aiden or Zach will laugh at how the writing sounds so different even though it is the same message as is in other translations. When we read the story of a leper who was healed by Jesus, I loved how Peterson rendered what Jesus said to the man. Jesus said, "'Don’t talk about this all over town. Just quietly present your healed body to the priest, along with the appropriate expressions of thanks to God. Your cleansed and grateful life, not your words, will bear witness to what I have done'” (Matthew 8:3,4 MSG). Think about this for a minute. Here we have a man who was considered 'unclean' because of his disease. He couldn't live with other people, no one would touch him and if he was near others he had to loudly declare himself to be "unclean, unclean" so that they wouldn't accidentally come too close to him. What a wretched, lonely and hopeless existence that must have been. Then, with one touch from Jesus, he is instantly cured. Put yourself in his shoes...what's the first thing you want to do? For me, it's run through the streets yelling, "I'm clean, I'm clean!" And as soon as I reach my family's home I'd stand outside and shout it even louder so all the neighbors would know, and then I'd hug everyone in sight. But Jesus tells him not to talk about it all over town. I guess that means shouting it through the streets is probably out of the question. The man is to present himself to the priests, who were charged with formally declaring him healed, which would then allow him to return to living as a normal, clean person. After that, his "cleansed and grateful life" is all that will be needed to show the world what Jesus did for him. Had the man returned to living as he did while afflicted with leprosy, then it wouldn't have mattered how many people he told about his healing. No one would believe him if he was still living separate from other people and wearing bandages as if his skin were still diseased. The very fact that he could live a normal life was statement enough about his healing. The interesting thing is, the same is true for us. We can go around talking and talking and talking about how Jesus cleansed us from our sin, but if the way we live looks just like it did before Jesus then no one will really believe us. Why should they care about what we say if we deny our healing with our actions? 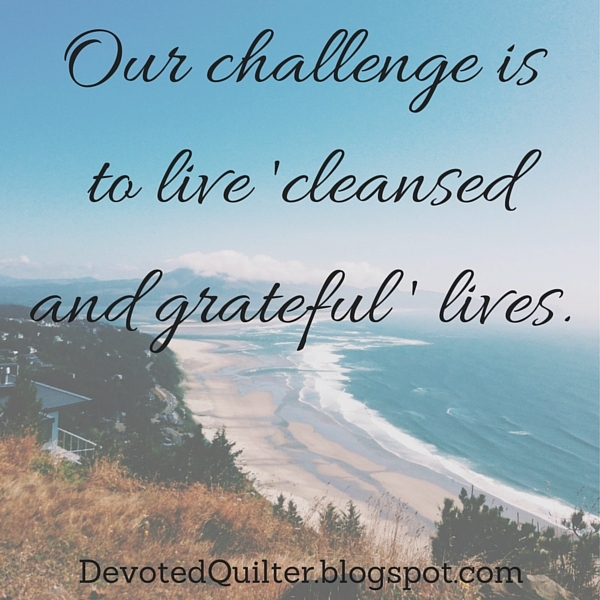 Our challenge, then, is to live 'cleansed and grateful lives.' To show by our actions how completely changed we are by what Jesus did for us. There are two parts to this - cleansed and grateful. Let's look at both of them. Cleansed speaks of the way Jesus changed our lives. Leprosy is a skin disease. Sin is a soul disease. Just as the leper was separated from his family, we were separated from God because of our sin. Now we have been cleansed and we can have a relationship with God. But what if we continue to gossip and judge others and cheat on our taxes and a myriad of other 'little' sins? What would that say to those around us about the soul healing offered by Jesus? If we have been cleansed of sin (and we have!) then we need to live lives that reflect that cleansing. Grateful speaks of our attitudes about what Jesus has done for us. Grateful and thankful are synonyms, so are we living lives that are full of thanks to Jesus for cleansing us? I'm sure we've all been around people who are constantly wanting more and more things, those who are never satisfied with what they have, no matter how good they have it. We've also been around people who are enduring a lack of some sort (financial, physical, whatever) and yet they are so grateful for what they have that somehow what they're lacking doesn't seem to matter much. Can you imagine the leper, now cleansed and living a normal life again, constantly grumbling about what he doesn't have? I can't. I imagine him as content as could be, because he remembers how bad life was before Jesus, and nothing he may lack now can compare with that. Is that how people would describe our attitudes? Cleansed and grateful. If that is how people would describe our lives, then really there is no need for constant talking about what Jesus has done. It will be obvious in everything we say and do. I read dozens of books about how to write well, how to develop stories and characters and even how to submit your writing to publishers. I probably spent almost as much time reading about writing as I did actually writing! My novel writing never quite matched up to my dreams though, and there's still no big fat novel with my name on it. I'm okay with that, mostly because I'm still writing, it just takes the form of blog posts and devotions here. Sometimes we have a hard time letting go of our expectations. We want something to happen and we believe it has to happen the way we've always envisioned it or it won't happen at all. Naaman, in the Bible, had some expectations too and when things didn't go as he expected he almost missed out on something big. You can read about Naaman in 2 Kings chapter 5 where we are told he was "commander of the army of the king of Aram. He was a great man in the sight of his master and highly regarded, because through him the Lord had given victory to Aram. He was a valiant soldier, but he had leprosy" (v. 1). While it's nice to know that Naaman was highly regarded because of his military expoits, I find the next two verses much more interesting in terms of his character. "Now bands of raiders from Aram had gone out and had taken captive a young girl from Israel, and she served Naaman’s wife. She said to her mistress, “If only my master would see the prophet who is in Samaria! He would cure him of his leprosy" (vv. 2,3). Here we have a slave girl recommending that her master go to the prophet Elisha to be cured of his leprosy. That tells me Naaman and his wife must have been kind to their slaves or this young girl would have just let the man rot in his disease and would probably have cheered every discomfort her captor felt. So, on the advice of his wife's servant girl, Naaman went to the king and received permission to visit this prophet in hopes of being cured. Naaman arrives at Elisha's door and Elisha sends a messenger to tell Naaman that all he has to do is go dunk himself in the Jordan river 7 times and he'll be healed. "But Naaman went away angry and said, “I thought that he would surely come out to me and stand and call on the name of the Lord his God, wave his hand over the spot and cure me of my leprosy. Are not Abana and Pharpar, the rivers of Damascus, better than all the waters of Israel? Couldn’t I wash in them and be cleansed?” So he turned and went off in a rage" (vv. 11,12). Did you see Naaman's unmet expectations? He expected Elisha to meet him at the door and wave his hand over the spots on Naaman's skin and so cure the disease. Instead, Elisha just sent a messenger with instructions. Naaman wasn't even going to bother following the instructions! His servants had to convince him that he might as well give it a shot since it was such a simple task. "So he went down and dipped himself in the Jordan seven times, as the man of God had told him, and his flesh was restored and became clean like that of a young boy" (v. 14). But Naaman almost missed it. He wanted God to heal him, but he had expectations of how it was going to happen and when those expectations weren't met, Naaman almost walked away and missed out on what God wanted to do for him. We all have things we want God to do for us, and we've all imagined how we think those things could happen. But what if God wants to do it a different way? He is not limited to what our imaginations can conjure up, after all. 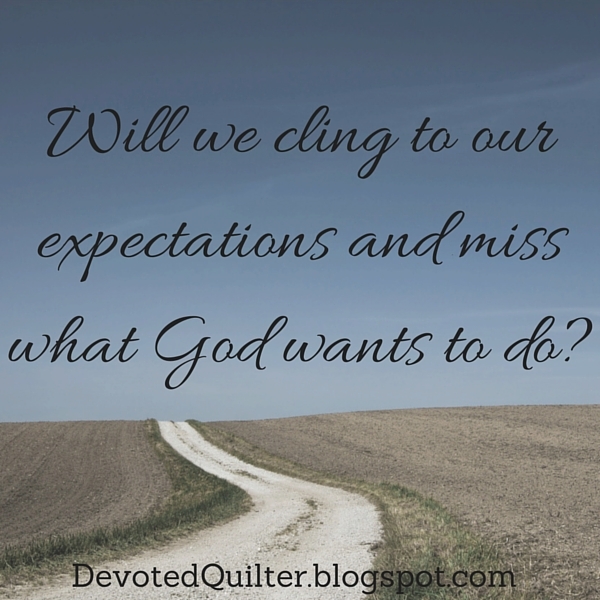 The question is, when the moment comes, will we cling to our expectations and miss what God wants to do? Or will we recognize the opportunity and run with it, straight into whatever God has planned for us? My mini quilt X Marks the Spot is in the latest issue of Make Modern magazine (affiliate link)! This is a great scrap-busting project and can be a quick finish too. 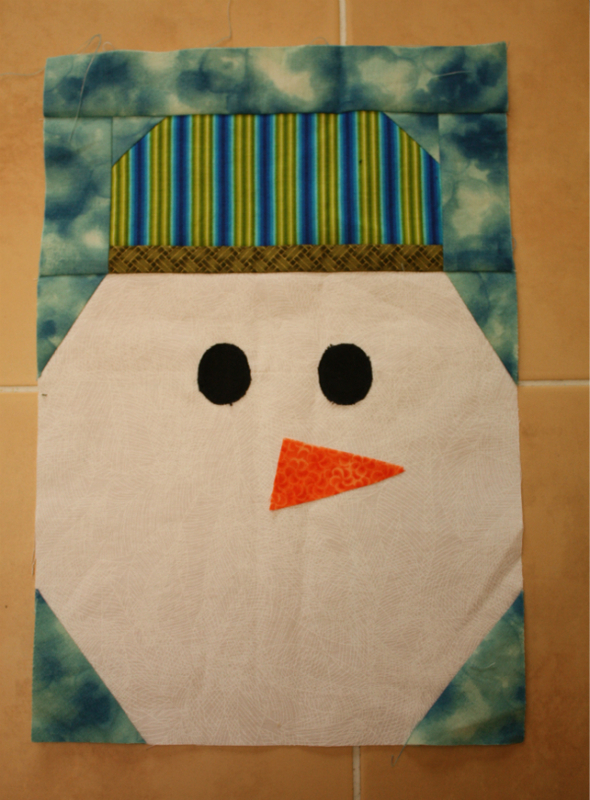 It measures 26" square, making it perfect for a table topper or for hanging on a wall. 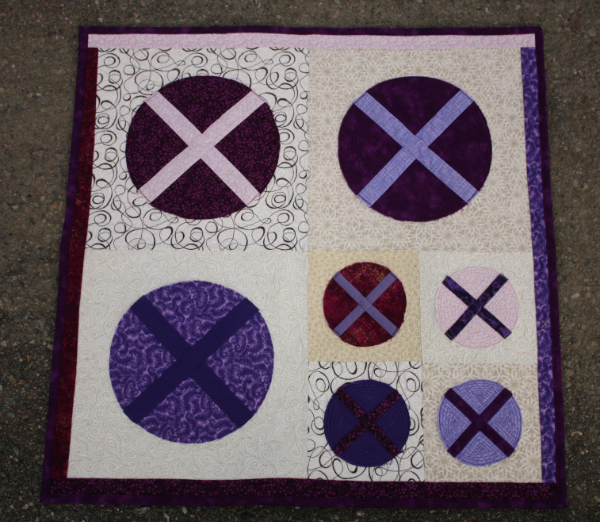 The x's are pieced and then the circles are appliqued to the background, so no tricky inset circles here. 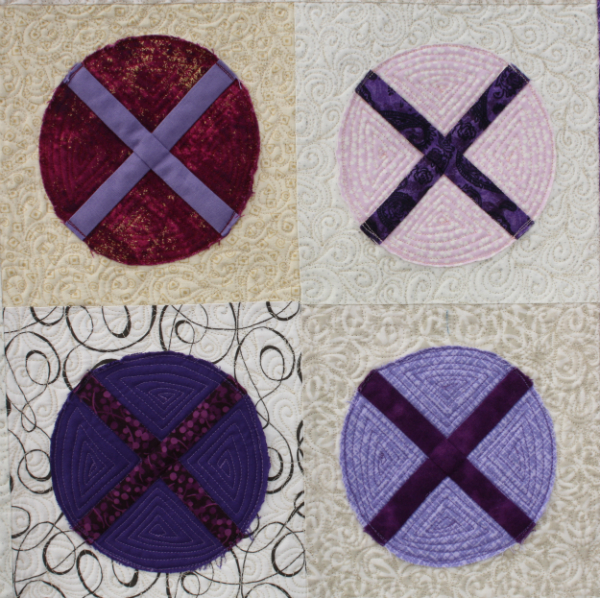 I quilted the spots in my version by outlining the x's and then stitching a spiral that matched the shape of each quadrant of the circle. I love how that makes the x really pop! For the background, I chose a quilting design called Flourish, from Christina Cameli's book Step-by-Step Free Motion Quilting. I really love this design! 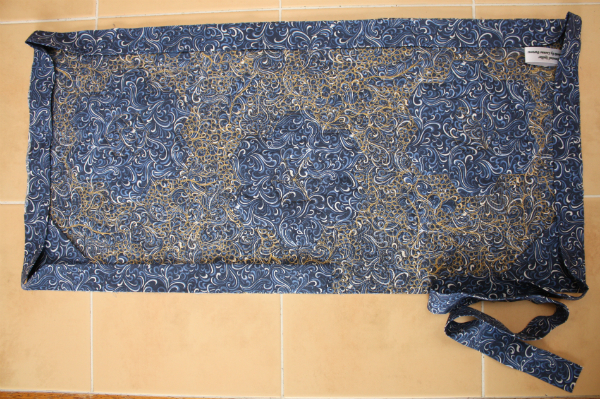 It's pretty, it's quick to stitch and it can fit into just about any space. I made one extra spot and added it to my pieced back. 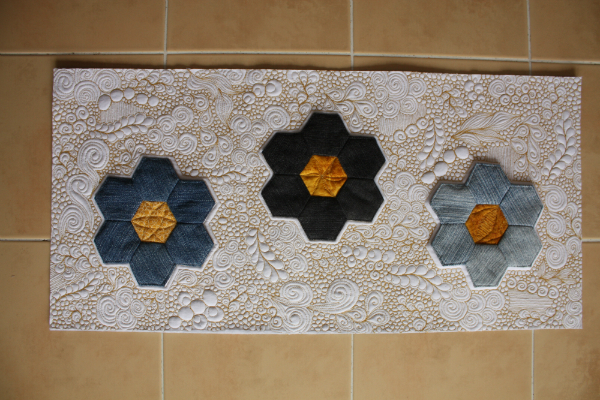 In this picture you can also see the linked circles I quilted in the borders. One of those circles has a faint x quilted through it as a little surprise for those who look closely at the quilt (in person, though - it doesn't show up in the picture)! The wonderful folks at Make Modern (affiliate link) have offered a special discount code for contributors to share - enter issue11friends at checkout to get your copy of issue 11 for just $6 AU. There are lots of other beautiful projects in this issue, so go check it out! 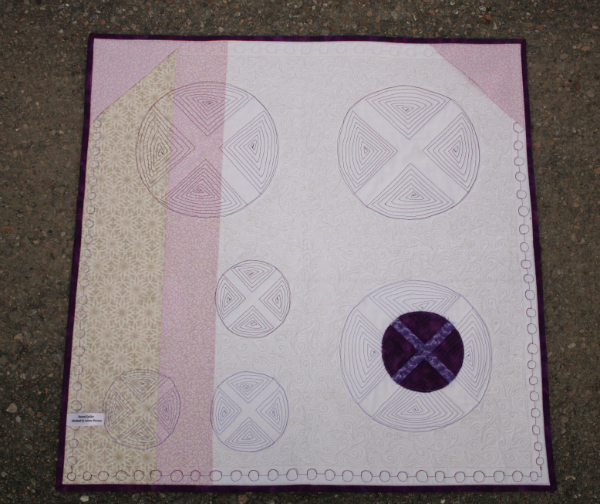 ** X Marks the Spot is now available for individual sale through my Payhip and Etsy shops. There are more than a few biblical stories about people who wished their cake dough. People who are unfamiliar with the Bible may think everyone in it is perfect, and they are all people who will make us feel inadequate because their actions line up so nicely with what God wants. The Bible, after all, is meant to teach us how to live - "All Scripture is God-breathed and is useful for teaching, rebuking, correcting and training in righteousness, so that the servant of God may be thoroughly equipped for every good work" (2 Timothy 3:16,17). Sometimes, though, the best way to teach someone is to show them what NOT to do. So, the Bible shares stories about people who really messed up in their work, like Joshua. He was told to go into the land of Canaan and destroy the people who inhabited the land. He was not to make treaties with the people because if they were allowed to remain in the land they would eventually turn the Israelites away from God and entice them to follow false gods. When the people of Gibeon heard about how the Israelites were destroying entire cities, they decided to try tricking the Isrealite leaders. "They went as a delegation whose donkeys were loaded with worn-out sacks and old wineskins, cracked and mended. They put worn and patched sandals on their feet and wore old clothes. All the bread of their food supply was dry and moldy. Then they went to Joshua in the camp at Gilgal and said to him and the Israelites, “We have come from a distant country; make a treaty with us" (Joshua 9:4-6). The Isrealites were taken in by the deception and "did not inquire of the Lord. Then Joshua made a treaty of peace with them to let them live, and the leaders of the assembly ratified it by oath" (vv. 14, 15). Three days later they learned that the people of Gibeon were actually their neighbors, and among those they were not supposed to make treaties with. But by that time it was too late. 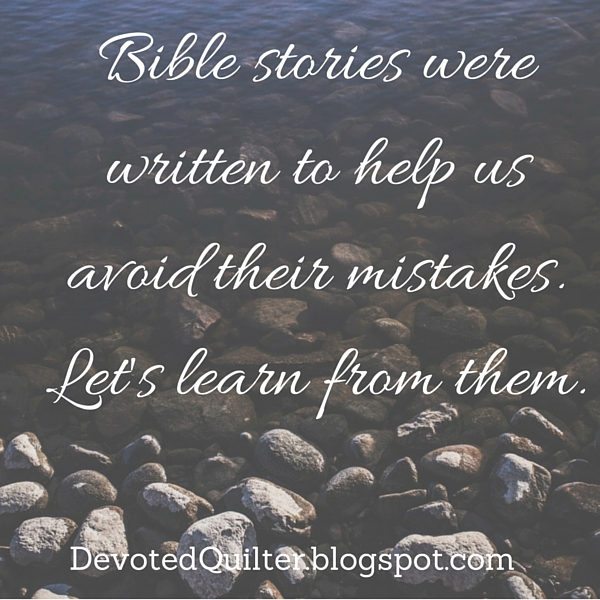 The Bible also shares stories of those who messed up in their personal lives. There is the story of David and Bathsheba. She took a bath on her roof, where she was seen by the king and he decided he had to have her, never mind that she was a married woman. When she became pregnant, David tried to arrange matters so it would look like the child belonged to her husband (who was away at war) and when that didn't work, he arranged for the husband to be killed and David married her as soon as the time of mourning for her husband was finished (2 Samuel 11). The prophet Nathan confronted David, who immediately repented, saying, "I have sinned against the Lord" (2 Samuel 12:13). But by that time, again, it was too late and the far-reaching consequences of his actions remained. Neither Joshua nor David could go back and undo what they had done. They could not unbake the cake. We are not in their same situations, but their stories have been recorded to help us avoid their mistakes, "These things happened to them as examples and were written down as warnings for us" (1 Corinthians 10:11). From Joshua, we learn the importance of checking in with God before making important decisions, and of not being deceived by appearances. Though we may not be at war with anyone, there are always times when we are tempted to follow our own understanding of a situation and not 'inquire of the Lord' to see if we've got it right. But taking the time to pray and seek God's view will often save us from mistakes that could be costly. From David, we learn not to "despise the word of the Lord by doing what is evil in his eyes" (2 Samuel 12:9). The temptations to sin are many and varied. We should be critical of our own actions, willing to take a hard look at what we plan to do and why. Had David done that when he was first tempted to send for Bathsheba, he could have avoided the whole mess. If we are willing to be diligent in this way, looking critically at our decisions as we make them, we can keep ourselves from things that are evil in God's eyes, and from the consequences that would come from those actions. We all know the sickening feeling of a mistake made, don't we? But like a cake that has been baked, we can't go back and change things back to the way they were before we made the mistake. How much better, then, to learn from the mistakes of others and avoid making them for ourselves! I've been busy with a bunch of other projects, so I let the last four months slip by without making the Sugar Block Club block, but now I'm finally all caught up. 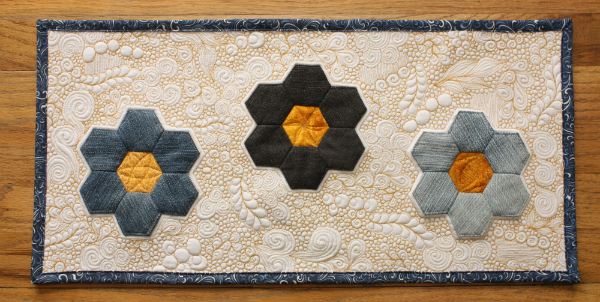 In case you're not familiar with the Sugar Block Club, it's a BOM run by Amy Gibson of Stitchery Dickory Dock and each month her block is based on a traditional block, but with a modern twist. I always look forward to the new blocks, even when I don't have time to make them in their proper month! I actually did make January's block back in January and over the past few days I've made the rest. February's block is a fun variation on a log cabin, which is a block I've always loved. I think a scrappy quilt of these would be a lot of fun. Those HSTs in the corners and the bright pink borders around them would make a great secondary pattern, don't you think? March's block is my favourite of the bunch so far. It's an orange peel variation, and I love how it looks layered, like that flower block is sitting on top of a star block. 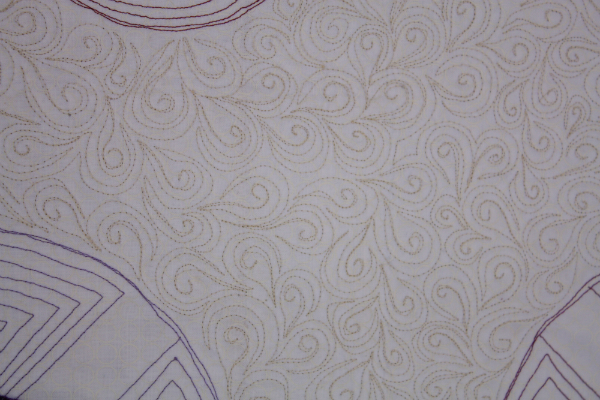 This is another block that I'd love to make into a full quilt...maybe one of these days! 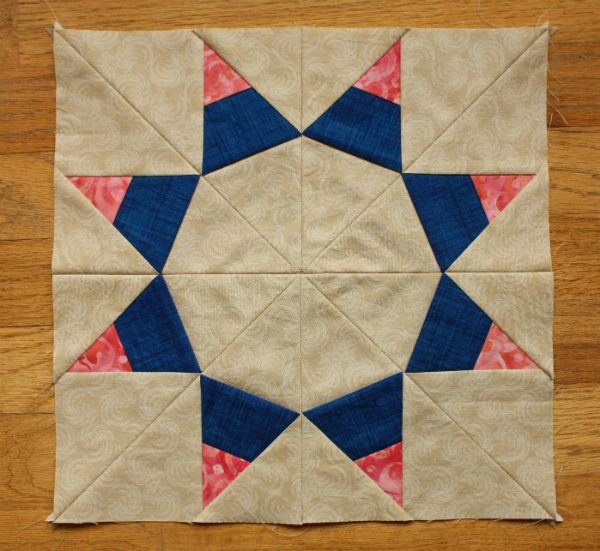 April's block is Amy's spin on the Ohio Star block. This one is probably my least favourite so far, though I'm not sure why. 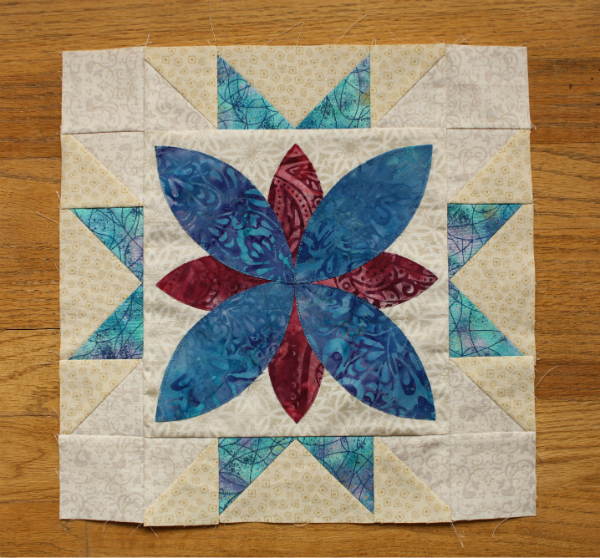 For May, Amy chose the Lone Star block and turned it into this fabulous Morning Star. Don't you love the precision of paper piecing?? Even though there's no deadline or anything with this project, it still feels good to be caught up. I think it's a psychological thing :) I'm also glad to have more blocks done now so I can see that I do really like the addition of the pink into the blue and beige/cream colour scheme I had going already with the blocks from Amy's 2013 Sugar Block Club. In other news, the first edition of my newsletter, The Bulletin, goes out on Monday morning. Yay! Have you signed up for it yet? If not, you can sign up here. Happy belated Mother's Day to all you moms out there! I hope you had a great day. When asked in church yesterday what makes his mom special, Nathan answered, "She's a mom." One of the other ladies in the church said after, "I knew exactly what he meant. Doesn't that say it all, really?" I love being Mom to my three boys, and I wouldn't change it for the world, but last week Paul took all three of them out of town for an overnight trip and I spent an entire evening all by myself. Even now that my boys are older and don't require nearly as much constant attention, it was still a nice treat to be alone. No one asking me to do anything for them, or asking if they could get a snack, or asking if they could (fill in the blank). I didn't have to do the bedtime routine with Nathan, or pay attention to the time to make sure Aiden and Zach got to bed on time. The next morning I had a quiet breakfast and, since I didn't have to pack any school lunches, I even got to sew for about 20 minutes before the kids I babysit started showing up. It was so relaxing! Being a mom can be hard. (Being a dad can be hard too, and if you're a dad reading this, all of it is just as applicable to you, so just change all the moms to dads as you read, okay?) Kids have a tendency to take up a lot of time and energy, especially when they're young. Time and energy that we may have wanted to spend on other things, like maybe sleeping or reading or quilting or talking with other adults. There are times when it's hard not to resent all those demands, no matter how much we love our kids. And yet, when we're able to keep our perspective, to remember that these kids of ours are growing up remarkably fast and won't always need us like this (or even live with us! ), then it's easier to find joy in serving them. Being mom is kind of funny that way...if we try to cling to our own wants, the things we want to do by ourselves or for ourselves, then we lose out on so much. But when we give of ourselves to serve our kids, then we can watch them flourish and we can enjoy the relationships we develop with them as they grow. These things are so much more meaningful than any of the selfish things we wanted to do could ever have been. In a way, living this way as a mom is a lesson in living as a disciple of Jesus. Talking to his disciples, Jesus said, "Whoever wants to be my disciple must deny themselves and take up their cross and follow me. For whoever wants to save their life will lose it, but whoever loses their life for me will find it" (Matthew 16:24, 25). In other words, whoever clings to their own selfish desires and lives entirely for themselves will gain nothing. They'll end up losing their chance at eternal life and a relationship with God. But those who put aside their selfishness and live for God, they are the ones who will find eternal life, who will find abundant life beyond anything they could have created for themselves, and who will have the richness of a relationship with the God who loves them. I know what kind of mom I want to be and I know what kind of disciple I want to be. I bet you do too. That doesn't mean I get either one right all the time, though. I have to fight against my desire to be selfish, both so I can be a good mom to my boys and so I can serve God the way I should. That selfishness shows up in the times I feel put out or annoyed because one of the boys needs or asks me to do something I don't want to do. It shows up in those times when I cringe inwardly when I'm asked to play a game when I'd rather just keep doing what I want to do. It also shows up in the way I don't always think to pray for others, or to ask people how I could pray for them, because I'm focused so much on my own family and our concerns. Though your triggers may be different, I'm willing to bet that selfishness rears its ugly head in your life too. Am I right? Fighting selfishness isn't easy and it's not a one time battle that we can win once and then never think about it again. Unfortunately, it's an everyday kind of battle, but if we want a good relationship with our children (and all of our family and friends, really) and if we want a good relationship with God, then the fight is essential. 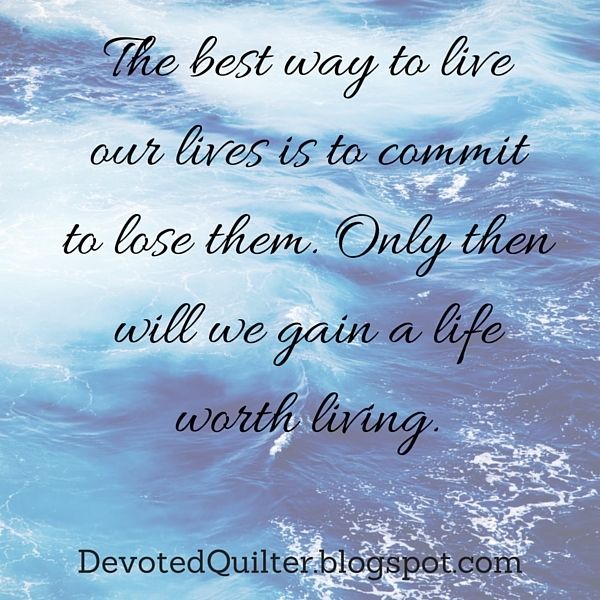 The best way to live our lives is to commit to losing them. Only then will we gain a life worth living. 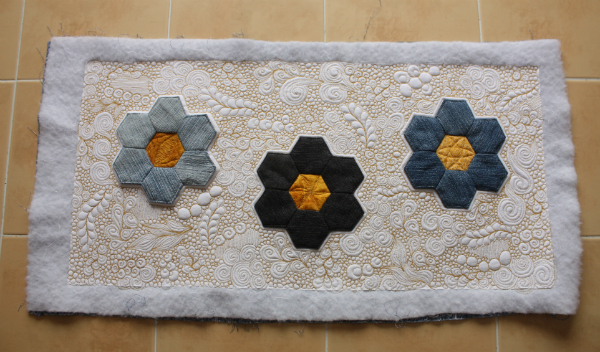 When it came time to bind my Denim Hexies mini quilt, I took pictures of the whole process so I could write a tutorial for how I bind my quilts. This is kind of a mash-up of all the different binding tricks I've picked up over the years and I hope you'll find something useful in my method. I'll warn you now, this is a long, picture-heavy post! Let's go! (Quilt length + Quilt width) x 2 + 20" = the total number of inches you need. That extra 20" is for mitering the corners and joining the two ends of the binding. Some people only add 10", but I like to be sure I'll have more than enough and I won't be struggling to get those ends joined. (11.5 + 22) x 2 + 20" = 87"
Assuming 40" of usable fabric in each strip, take your total number of inches needed and divide it by 40, then round up to get the number of strips you need to cut. I will confess that because I only needed .175 of a third strip, I did go with only using two strips and it worked fine, so use your own judgement if your number comes out to be just barely above a whole number. How wide you cut your strips is, in part, a matter of personal preference. 2 1/2" seems to be the most common measurement, but I prefer to cut mine at 2 1/4" as I find it makes for a neater finish. The best way to figure out what you prefer is to bind a couple of quilts with each measurement and choose which one works best for you. There is no right or wrong answer on this one. Once you've cut as many strips as you need, it's time to join them together. We'll join them with a diagonal seam to reduce the bulk. Place the end of one strip on the table, right side up. Place one end of a second strip on top, right sides together and perpendicular to the first strip. Check to be sure this is actually a separate strip and you're not joining the two ends of one strip together (yes, I have done this!). I like to leave a smidge of fabric visible at the ends so I can see the intersections better. 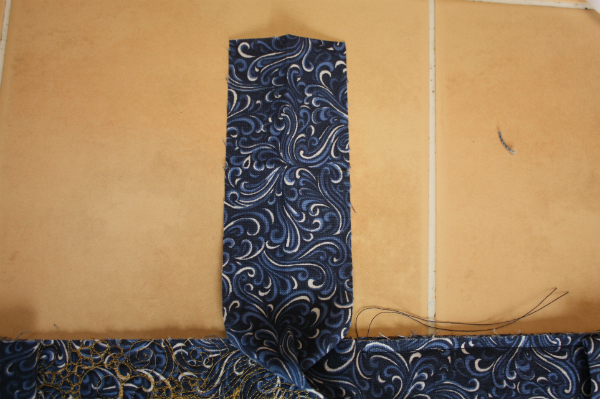 It helps me sew a straighter line :) Pin the strips together. Stitch a diagonal line from the intersection at the top left to the intersection at the bottom right. 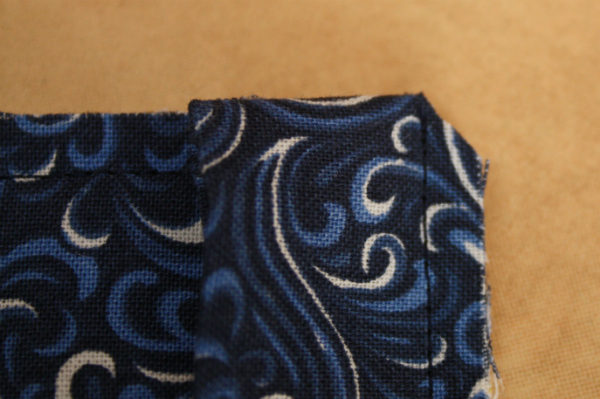 You can mark this line before stitching if you want, but it's such a short seam that I find marking isn't necessary. 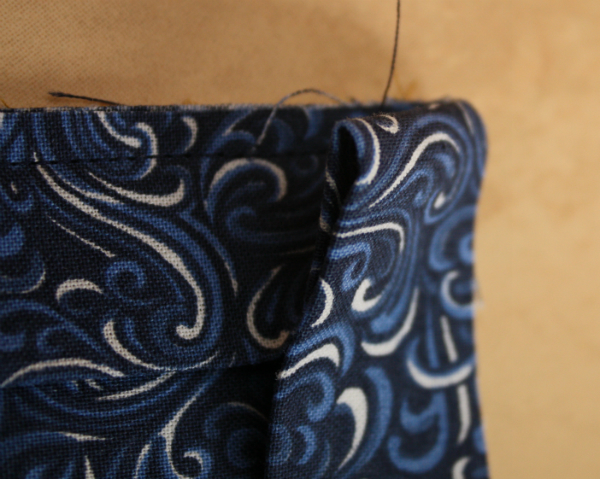 Trim off the corner, leaving a 1/4" seam allowance. Press the binding in half along the entire width, wrong sides together. 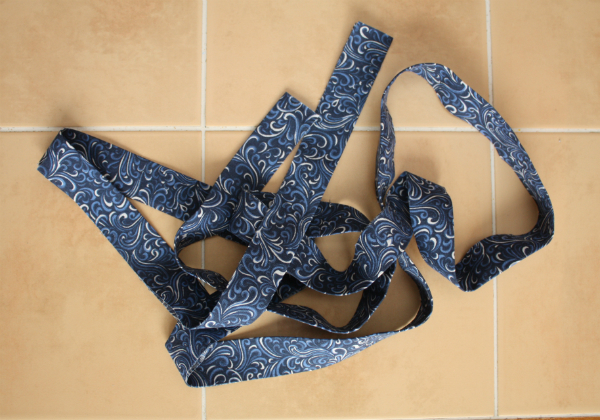 You now have one long strip of binding ready to attach to your quilt! I'm only binding a mini quilt, so my strip isn't actually all that long, but if you're binding a bed-sized quilt, your binding will be much more impressive looking! At this point, depending on when you'll actually attach it to your quilt, or your social media needs, you could roll the binding into a pretty circle, or you can do as I usually do and leave it like this. 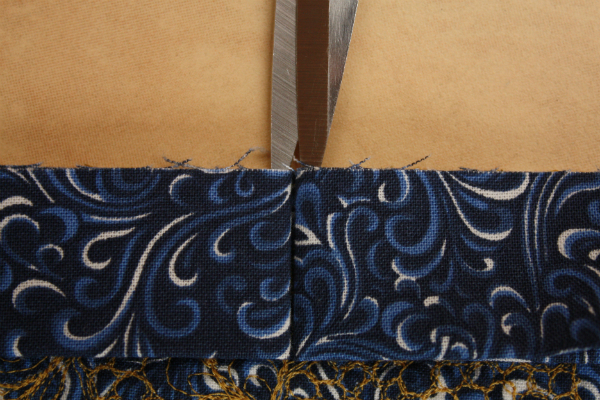 Before you can attach the binding to your quilt, you need to trim off the excess batting and backing. It looks more like a finished quilt already! 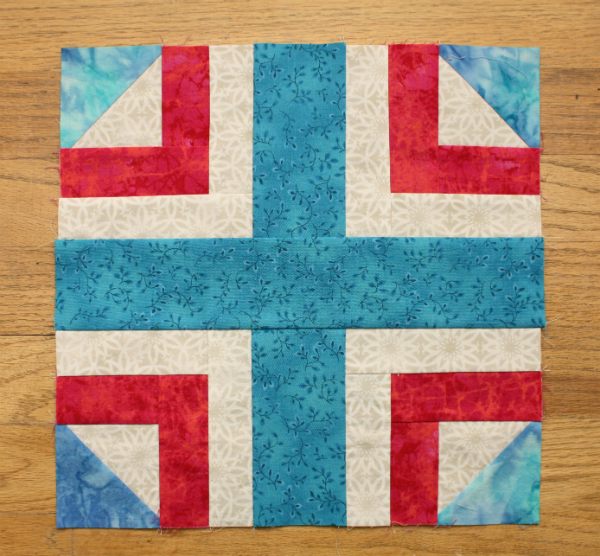 If you want to add triangles in the corners for hanging your quilt, now is the time to do that. I recommend this tutorial. As you can see, I also add my label before adding the binding. It's a good idea to check placement before you actually stitch the binding on, to be sure none of your seams are going to end up on a corner. That makes the corner bulky and not at all neat (ask me how I know...). To avoid that, lay your quilt down on the table or floor, with the back facing up. 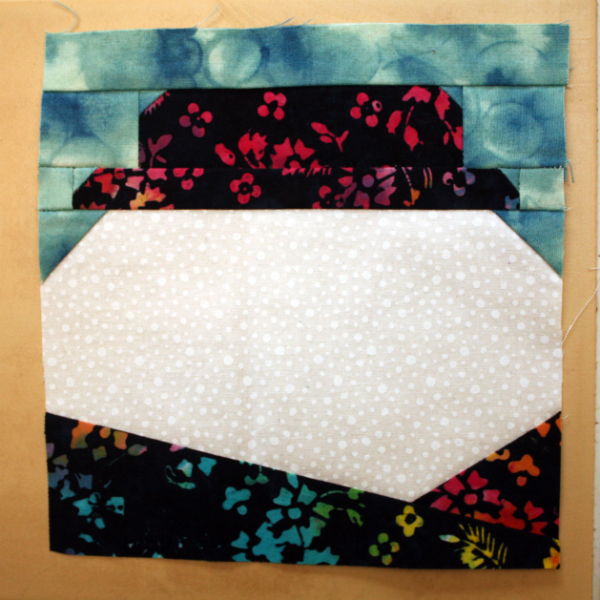 Starting part way along one side, lay out the binding, keeping it right at the edge of the quilt and adding a little extra at the corners to simulate the miter. 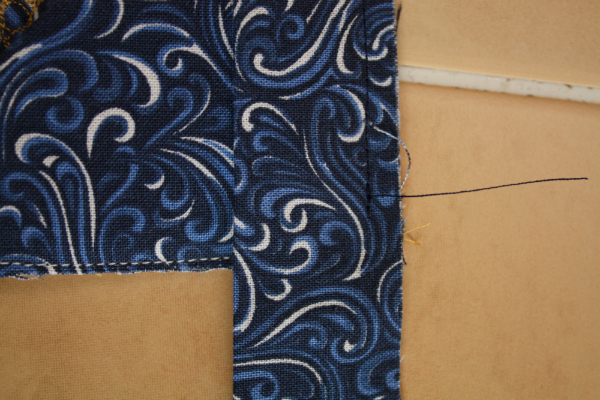 If a seam ends up on a corner, move your starting point farther up or down to move the seam away from the corner. 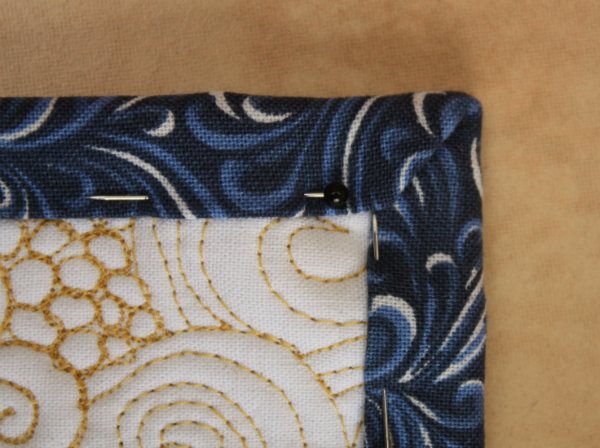 I'll often stick a pin in to hold the starting edge of the binding in place as I move to my machine. Attach your walking foot to your sewing machine. 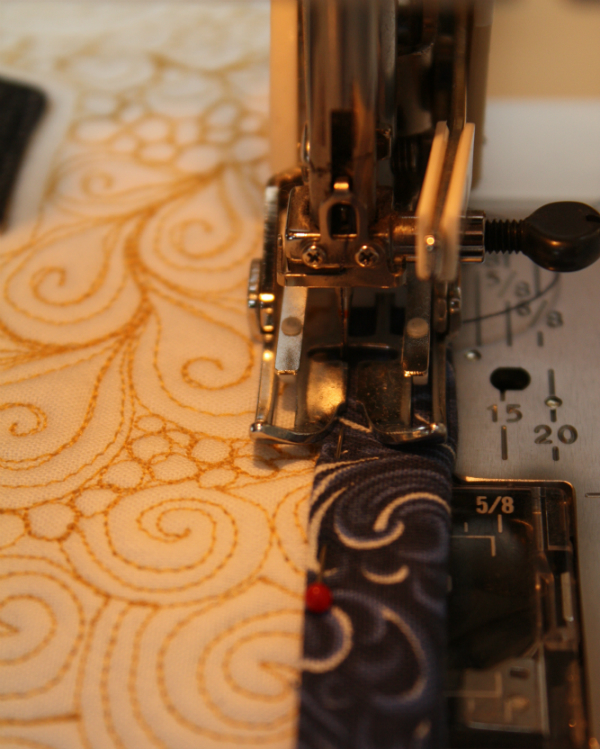 I find using the walking foot makes attaching the binding much easier. I also use a machine quilting glove on my left hand as I sew. That gives me a lot more control over the bulk of the quilt as I'm trying to move it, especially if it's a larger quilt. 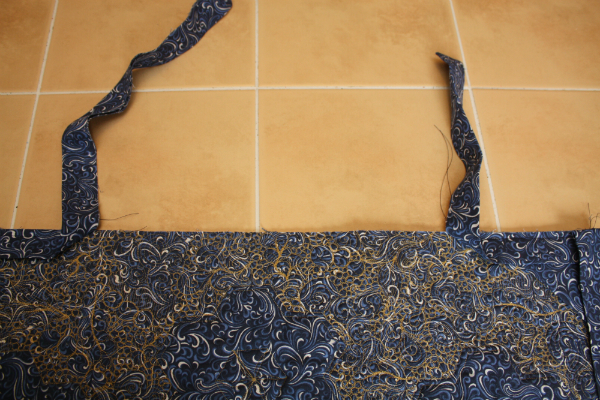 Don't start sewing right at the beginning of the binding strip. You'll want to leave a tail that is at least 6" long and I usually go more like 8". I really don't like struggling with those ends when I'm trying to join them together! In this picture, the scissors are pointing at the pin where I would start sewing. 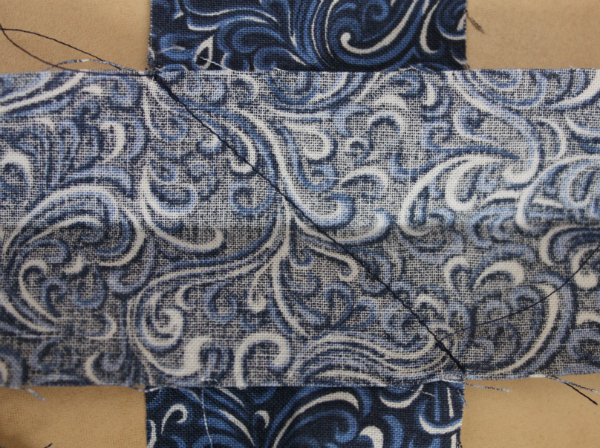 With the raw edge of the binding matching the raw edge of the quilt, start stitching the binding. 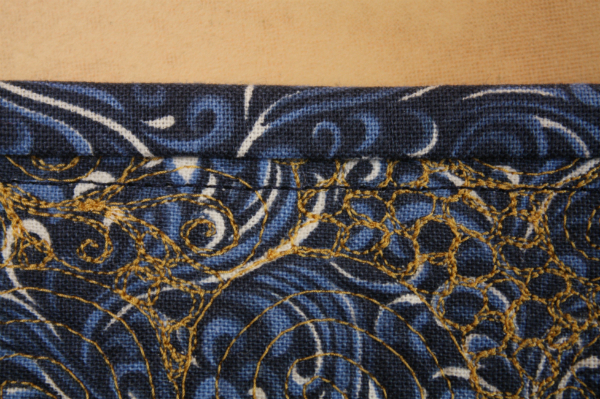 Backstitch at the beginning and use a 1/4" seam. 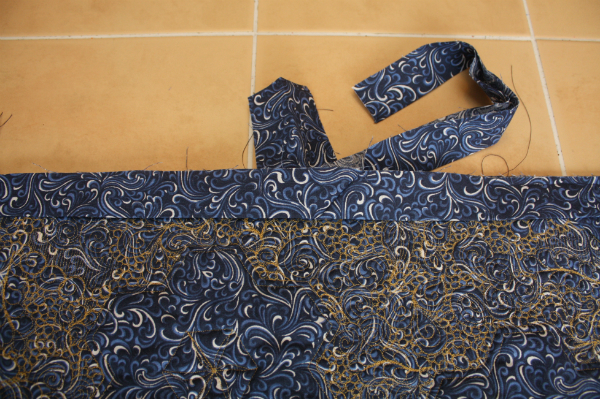 Stop sewing 1/4" away from the corner and backstitch. 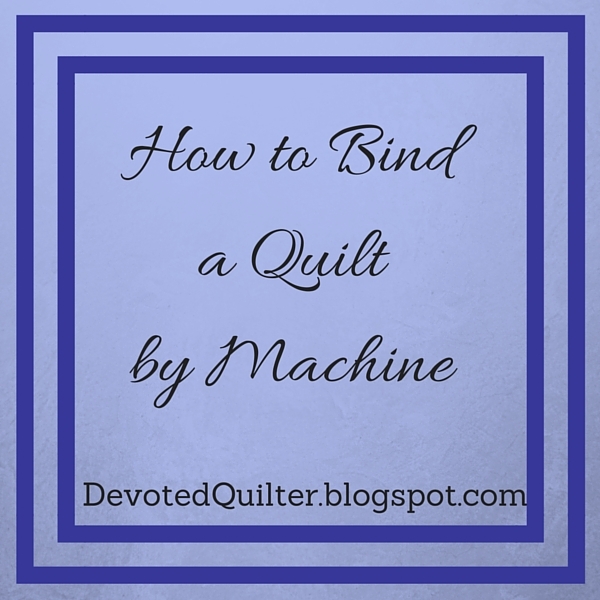 Take the quilt out of the machine. 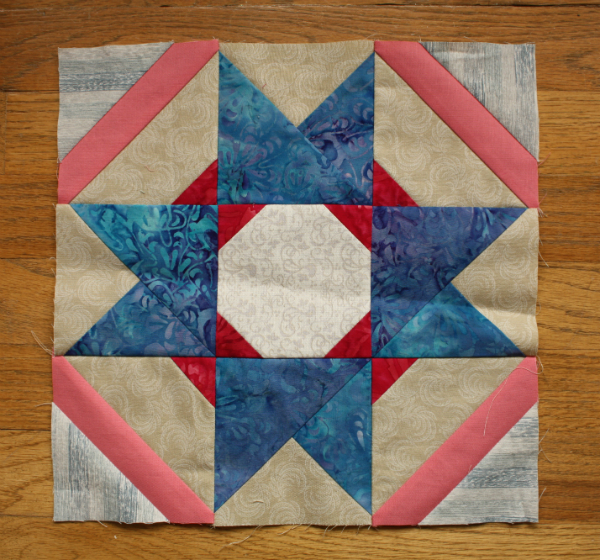 Turn the quilt so the side you just sewed is at the top and the next side is on the right. Fold the binding up away from the quilt, forming a diagonal fold. 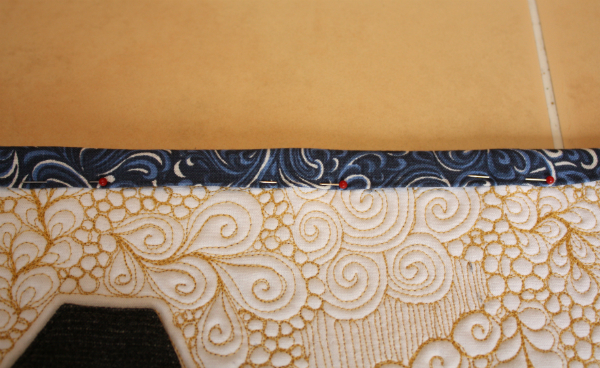 The raw edge of the binding should form a straight line with the raw edge of the quilt. Fold the binding back down along the edge of the quilt. 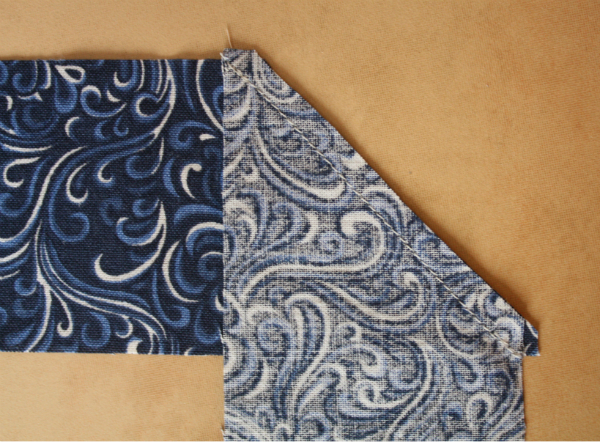 The fold should match the top edge of the quilt. This will leave a flap at the corner that we'll use to create the miter. 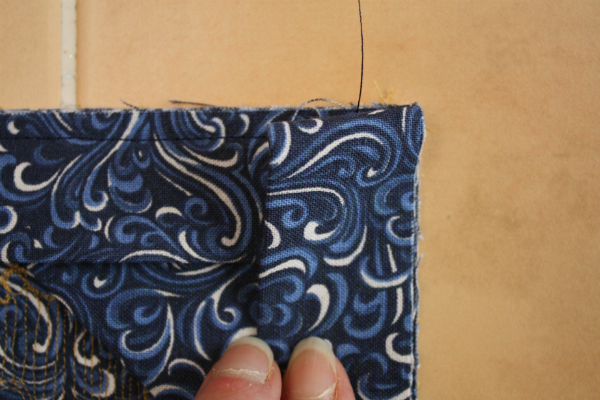 Start stitching right at the top edge, backstitching again and using a 1/4" seam. Repeat for the three remaining corners. 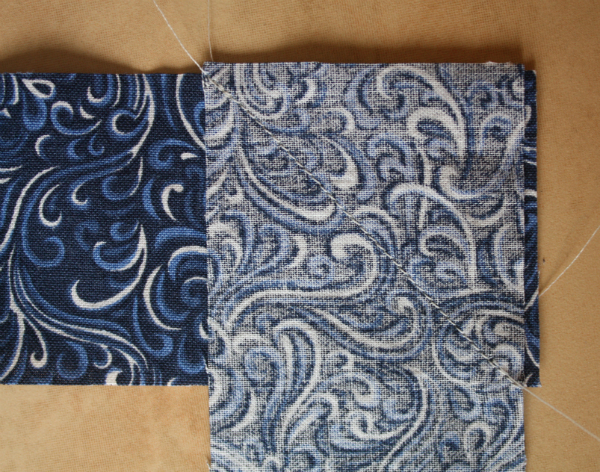 Take the two strips and lay them nice and flat against the quilt, folding them back on themselves where they meet. Snip about 1/8" at the folds. Take the right hand strip and open it out flat. Turn it so it is at a right angle to the quilt, right side up, as shown. You can see the little snip in this picture. Now, take the left hand strip and find the snip. Lay the left hand strip right sides together with the first strip, matching the snips. You may need to fold your quilt to make it easier to bring the strips together. Sometimes I even find I need to pin a fold into the quilt so it won't keep pulling the strips apart. Pin the strips together. Again, you can see the snips in this picture. Stitch a diagonal line from the top left intersection to the bottom right intersection. Again, you could mark this line if you want, but I don't bother. 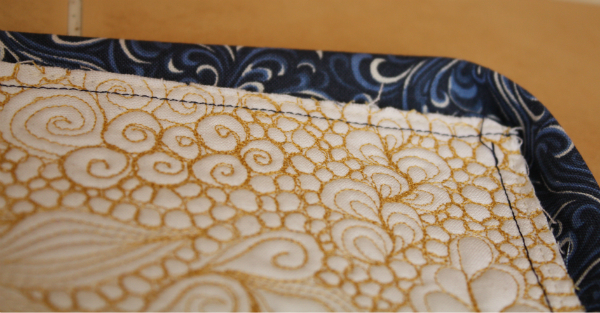 Straighten out your quilt to make sure the binding lies nice and flat as you've sewn it. 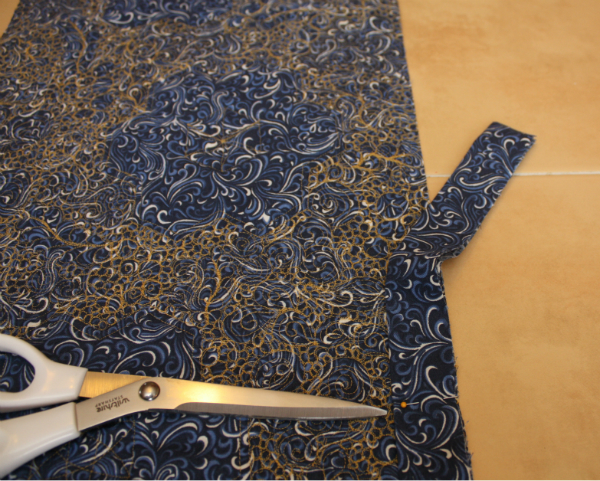 If there's an issue, it's better to find out now rather than after you've trimmed off the excess fabric. 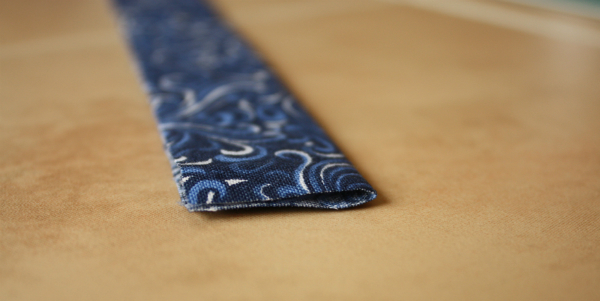 If everything looks good, then trim off the excess fabric, leaving a 1/4" seam allowance. 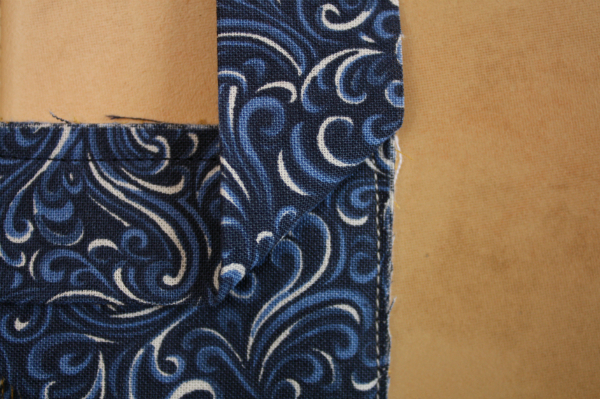 Press the seam allowance, then press the fold back into the binding. 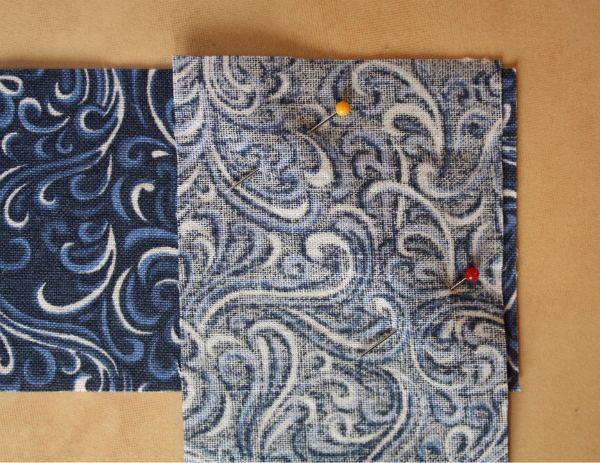 Stitch the gap between your starting and stopping points so that the entire binding is attached to the back of the quilt. Trim the corners. 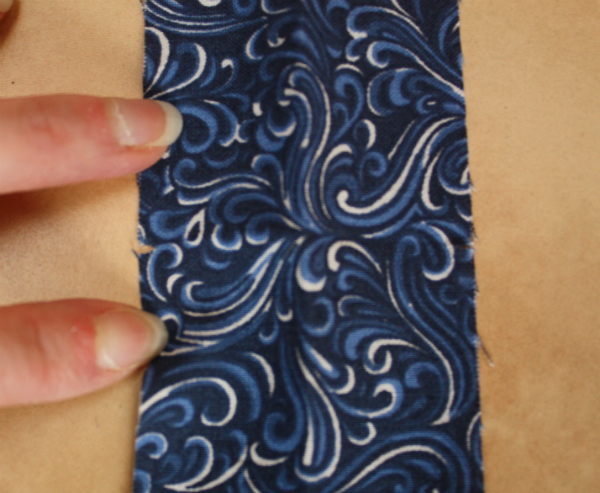 I find this helps to make the corners of the binding look neater. Just be careful not to cut your stitching lines. 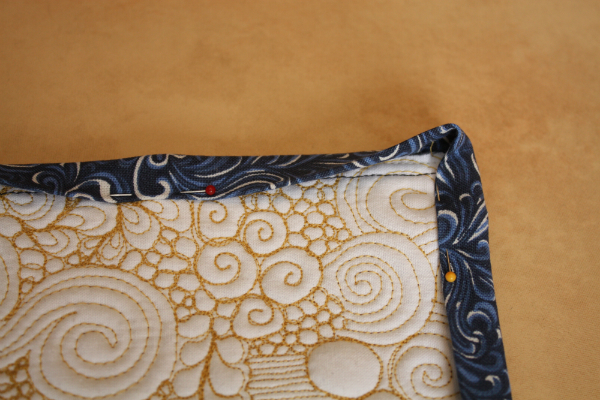 Press the binding away from the back of the quilt. This is a tip I picked up more recently (like maybe a year ago) and I'm amazed at the difference it makes. Such a small thing, but it really makes the finished binding looks more professional. Flip the quilt over and pull the binding up so that it faces the front of the quilt. 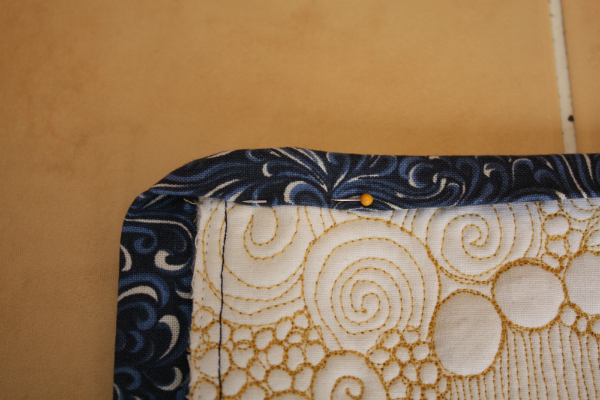 Fold the binding down over the raw edge of the quilt and pin in place. If you have Wonder Clips, this is a great time to use them. I don't have clips, but I find pins work really well and I hardly ever stab myself with them. Even when I'm handling large quilts :) It probably helps that I use pins that are a little on the smaller side. 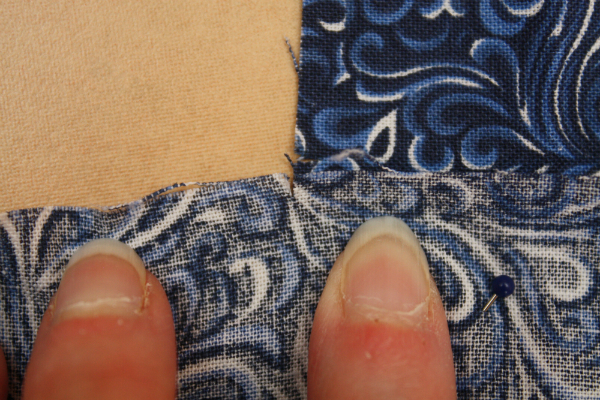 Keep the pins fairly close together so the binding lays flat between them. ...then I turn the quilt so the next side is at the top and pin a little ways away from the corner. This helps keep the binding from trying to flip up as I'm folding the corner neatly. To fold the corner, start with the side that you were pinning first, then fold the second side on top of it, which will give you a nice mitered corner. Pin close to the corner on the second side. 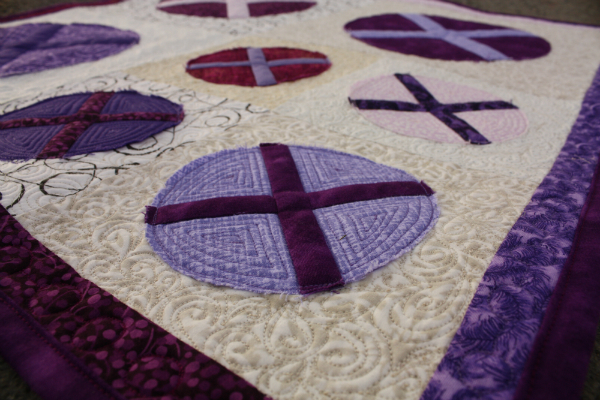 Repeat that process as you work your way around, pinning the binding around the entire quilt. 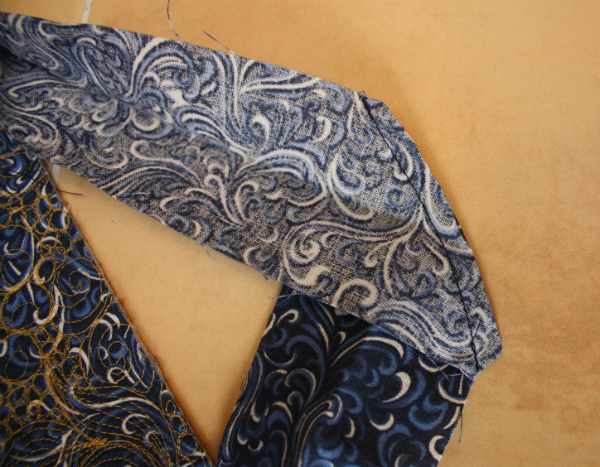 At this point, make sure you're using thread that blends with your binding fabric on top. 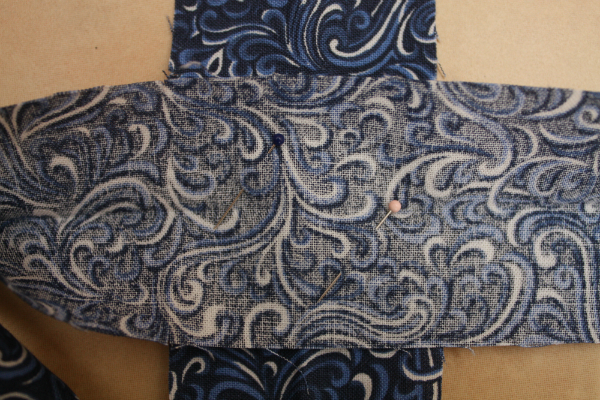 On the bottom, I tend to go with thread that will blend with the backing fabric. I really struggle with getting a good picture of something under the needle in my machine, so this next picture isn't great, but hopefully you can see well enough. 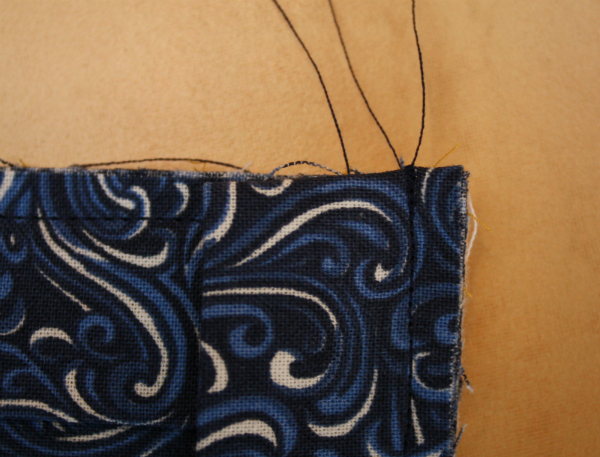 I shift my needle slightly to the left for this part and try to stitch really close to the folded edge of the binding. If you look past the needle in the picture, you can just barely see that there are gaps in the metal of my walking foot. I use the inside edge of the gap on the left as my guide. I recommend stitching slowly, taking out the pins just as they reach the front of the walking foot. 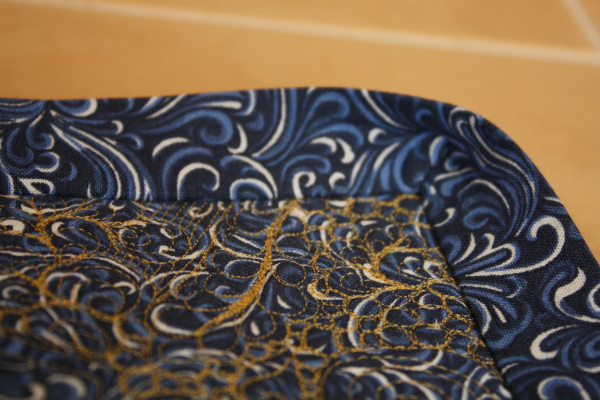 This is what the finished binding will look like from the front. And this is what it looks like on the back. 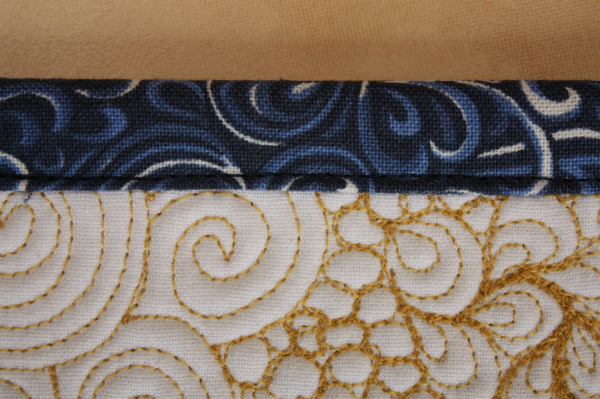 In hindsight, I probably should have used the Connecting Threads thread in "Honey' (affiliate link) rather than the blue as that would have blended in better with the quilting. 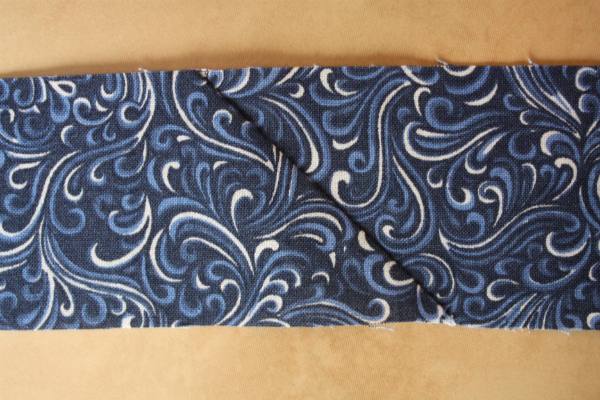 And there you have it - one perfectly bound quilt! I'll be linking up with NTT, Can I Get a Whoop Whoop, Finish it Up Friday and Let's Bee Social. This post contains an affiliate link. That means that if you click on the link and then make a purchase, I may receive a small commission. It does not affect the price to pay.